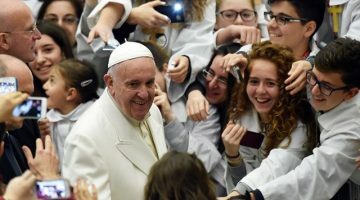 Pope Francis drew inspiration for his homily on Monday morning, from the Gospel reading that tells of the mercy of Jesus when he does not allow the execution of a woman who was caught in adultery. The reading is well known. It narrates the episode in which the scribes and the Pharisees brought a woman to Jesus who had been caught in the act of adultery. They point out that in the law, Moses commands us to stone such women because adultery is considered a very grave sin. Marriage – Pope Francis said – is a human reality but it is also a symbol of a faithful relationship between God and his people. When the marriage is spoilt by adultery, he continued, it spoils the relationship with God. But when the scribes and the Pharisees ask Jesus “what do you say?” they do so to test him, so that they could have some charge to bring against Him. The Pope pointed out that they cared nothing about the woman; “they did not care about adultery, perhaps amongst them there were some adulterers. All they cared about was catching Jesus in a trap”. And to this – Pope Francis said – Jesus answered: ‘Let the one among you who is without sin be the first to cast a stone at her’. And in response, they went away one by one, beginning with the elders. 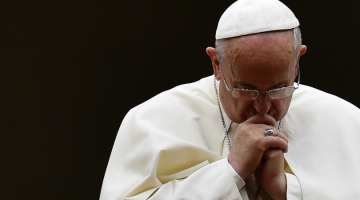 So one can imagine – the Pope observed – that their own records were not that straight. “So Jesus was left alone with the woman before him and said to her: ‘woman, where are they? Has no one condemned you?’ It is just you and I, alone before God, without accusations, without gossip. You and God! No one has condemned you. She replied: ‘No one, sir’”. But Pope Francis said: “she does not say it was a false accusation! She does not say‘I have not committed adultery’. She recognizes her sin. “Then Jesus said: ‘Neither do I condemn you. Go, [and] from now on do not sin anymore,’ do not offend God again; do not spoil the beautiful relationship between God and his people”. “Jesus goes beyond the law. He does not say: ‘adultery is not a sin!’ But he does not condemn it according to law”. This – the Pope said – “is the mystery of mercy. It is the mystery of the mercy of Jesus”. And the Pope said that when he is asked whether mercy removes sins, he answers that it is God’s forgiveness that removes sins: “mercy is the way in which God forgives our sins”. This biblical episode – Pope Francis said – shows us Jesus’s merciful attitude when he advises the woman not to sin again and to go in peace. “He defends the sinner from her enemies; he defends her against a just condemnation”. “We look at the sky, there are many, many stars; but when the sun rises in the morning, the light is such that we can’t see the stars. God’s mercy is like that: a great light of love and tenderness. God forgives us, not with a decree, but with his love, healing the wounds of sin. Because He is involved in forgiveness, He is involved in our salvation. So when Jesus acts as confessor to the woman he does not humiliate her, he does not say: ‘What have you done? When did you do it? How did you do it? With whom did you do it?’ No! He says: ‘Go and do not sin again!’. God’s mercy is great, Jesus’s mercy is great. Forgive us and heal us!